Our learning in phonics is central to our EYFS and KS1 classes and it underpins and supports all the work we do to encourage our children to read fluently and have a love of books and reading. The children from Pre-school through to Year 2 are taught a systematic phonics programme to help them to decode, segment and blend words using blocks of sounds (phonemes) and to write these sounds (graphemes). The children will sit a statutory phonics screening test in Year 1 Summer term to assess their progress again National standards. 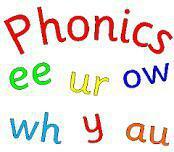 Our phonics learning is supported by our use of Bug Club reading books, Floppy's phonics and Phonics Bug reading books. A whole range of different resources are used to teach phonics and we especially like to make our learning active, even running many of our sessions outdoors! Ask your class teacher, attend one of our open phonics sessions/parental training sessions (see newsletter for details) or come and see Mrs Gow if you would like any further information about how to help your child with phonics at home.